Writing about dance can be difficult. Finding the words to accurately describe dancing can be like catching a butterfly or as the famous choreographer, Merce Cunningham once quipped, it’s like “nailing jello to a wall.” However difficult it is to write about dance, it is no less important. Writing becomes the memory bank for our dancing past, and an important way to think about and analyze the art form. The Connecticut Dances collection of dance writing has been created to help one experience many aspects of Connecticut’s dance history through personal stories, memories, reviews and essays, and will be a treasury of our history for generations to come. The Connecticut Dance Alliance is grateful to those who submitted writings for the compendium and looks forward to collecting additional dance articles, essays and personal recollections. Dance is ephemeral. It exists for a moment in time and then evanesces. The remains of the dance are personal impressions and memories, professional critiques, memoirs, biographies, historical essays, photographs, systems of notation and most recently, film and video. Unlike the visual arts, which are tangible and can be seen in any given museum, capturing the fleeting nature of dance can be a challenge. 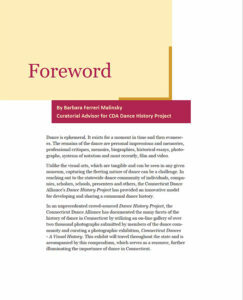 In reaching out to the statewide dance community of individuals, companies, scholars, schools, presenters and others, the Connecticut Dance Alliance’s Dance History Project has provided an innovative model for developing and sharing a communal dance history. In an unprecedented crowd-sourced Dance History Project, the Connecticut Dance Alliance has documented the many facets of the history of dance in Connecticut by utilizing an on-line gallery of over two thousand photographs submitted by members of the dance community and curating a photographic exhibition, Connecticut Dances – A Visual History. This exhibit will travel throughout the state and is accompanied by this compendium, which serves as a resource, further illuminating the importance of dance in Connecticut. The exhibition with its compendium of articles, scholarly essays, memoirs, and associated photographs reaches back to our earliest Connecticut social and cultural dances and continues to the present. It comprises a series of portraits of the art of dance that mirrors the exhibition panel themes and represents Connecticut’s significant dance heritage. Presenting a wide variety of dance forms, it includes important historical dance events, the pioneering work of individual dancers, choreographers, companies and the impact of schools and teachers. The exhibition brings to life the valuable contributions that dance has brought to the cultural vitality of Connecticut. The story of dance in Connecticut is one of excellence, inspiration and creativity. Connecticut Humanities is proud to help the Connecticut Dance Alliance to tell this story for the first time in a travelling exhibition. It is a wonderful, original exploration of evolving human expression through art that reflects changes in our culture over time.